We believe that we honor God by serving His people. To that end, we offer our best work at the most affordable price possible. The quality, comfort and durability of our church furniture and pews enhance your worship service. We also stand behind our products: all our worship seating and church furniture is backed for a lifetime of service. Rex Blisard, the founder and owner of Born Again Pews and a devoted fan of the A&E reality television show Duck Dynasty were able to showcase the custom church pew made just for the DD crew, in their main headquarters. Born Again Pews takes great pride in the fact that we service ALL churches, no matter the size. Born Again Pews is very skilled at new church pews installations. Born Again Pews is a church furniture company that manufactures church products and services available for a congregation that needs furniture. Located in Kansas, Oklahoma, Born Again Pews is experts in designing, refinishing and building custom church pews, tables, chairs and pulpits. The basis of our company is derived from our passion to serve people who require long-lasting, durable and comfortable church furniture. At Born Again Pews, we custom build handcrafted church pews, pew ends, plupits, chairs, and many other church furniture items. We use solid red oak to build all our church furniture designs. The solid red oak is heavy and hard which produces a timeless and beautiful finish. We offer a lifetime manufacturer warranty for all church furniture products. We started Born Again Pews in 2005 to help smaller churches save money and have access to quality church furniture. We offer quality church products to small churches and congregations with the need and ability to customize church furniture. 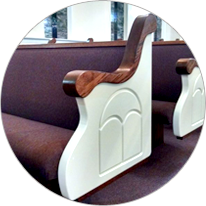 With Born Again Pews, smaller churches can customize and personalize each furniture item to satisfy their unique worship style. We specialize in making handcrafted church pews and selling used pews that are in mint condition. Pew ends enhances the design and function to provide comfort and durability. Each of our pulpits are custom designed to suit the place of worship for the church. we are providing for. 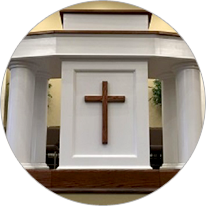 We offer a choice of a basic pulpit design or a custom pulpit design for a harmonious setting. 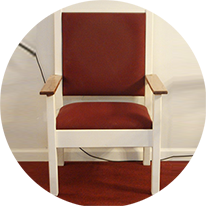 We provide church chairs for multiple functions like church choir and overflow of your congregation. The church chairs are stackable and convenient for moving and storage. Price Match and Free Quotation! Our founder and owner, Rex Blisard, was able to meet A&E reality television stars from Duck Dynasty and discuss the business goals of Born Again Pews and receive their support for our mission. We are an American owned and operated church supply manufacture located in Kansas, Oklahoma. 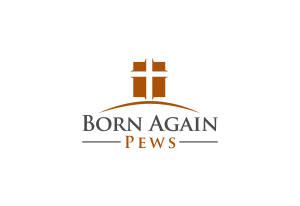 Born Again Pews is a customer- focused company with 13 years of experience and we are dedicated to the churches we serve. We are a team of trustworthy, caring people and top quality church furniture is the basis of our locally owned and operated business. At Born Again Pews, we handcraft all new church pews, pew ends, pulpits, chairs, and other church furniture items from solid red oak, taking God’s gift to us, and building beautiful church furnishings to worship Him. Our worship furniture is solid, comfortable and attractive. We know you will be fully satisfied that we guarantee our used church pews & new church pews furniture for life!